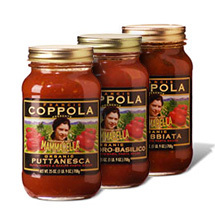 Bumbola Pasta: One of our organic cuts, is a hearty pasta formed in a bumblebee shape. Bumbola, along with the other five cuts, is based on using antique bronze molds and dried on wooden racks as they were over 100 years ago. This age-old process gives the pasta its delightful tooth, or mouthfeel. 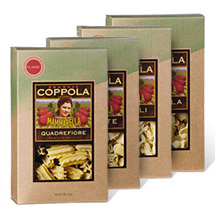 Quadrefiore Pasta: Quadrefiore is a dense, meaty pasta that really captures the sauce. It is shaped like a square flower. Be careful not to undercook; usually 15-18 minutes. Rosette Pasta: Rosette pasta is shaped like a rose on one side and a wagon wheel on the other. Be careful not to undercook; usually 10-12 minutes. Gemelli Pasta (***Currently sold out***): Gemelli pasta gets its name from the constellation (the Twins); it is like two thick-walled pastas twisted together. Be careful not to undercook; usually 15-18 minutes. Net weight of each pasta box: 12oz.